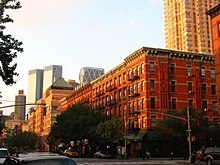 ^ MANHATTAN RENTAL MARKET REPORT. 紐約時報. 1985年12月22日 [2012年11月3日] （英语）. ^ CLINTON FRETS OVER THAT GLEAM IN DEVELOPERS' EYES. MNS房地產集團. 2012年9月 [2012年11月3日] （英语）. 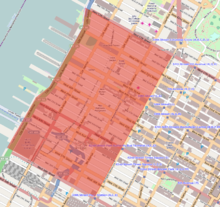 ^ History of Hell's Kitchen Neighborhood. 花園城市地區愛爾蘭文化學會（Irish Cultural Society of the Garden City Area）. 1994年9月 [2012年11月3日] （英语）. ^ 4.0 4.1 The Five Points. 地獄廚房鄰里協會（Hell's Kitchen Neighborhood Association, HKNA）. [2012年11月3日]. （原始内容存档于2010-12-21） （英语）. ^ 5.0 5.1 5.2 Clinton/Hell's Kitchen. Klara Madlin R.E. [2012年11月3日]. （原始内容存档于2008年11月20日） （英语）. ^ Alicia Keys. 時人雜誌（People）. [2012年11月3日] （英语）.